VVA Chapter 634 assisted a Vietnam veteran in receiving replacement medals in Jackson, Ohio. Warner Cox served two tours in Vietnam with the U.S. Army and was honorably discharged as a sergeant. For his service, he received Purple Heart, the Vietnam Service Medal, the National Defense Service Medal, the Republic of Vietnam Campaign Ribbon, and the Combat Infantry Badge. Cox’s medals and decorations were stolen six years ago during a home move and he reached out to Chapter 634 for assistance. The chapter facilitated contact with U.S. Congressman Bill Johnson (R-Marietta), a retired lieutenant colonel from the U.S. Air Force. Johnson and his staff appreciated the opportunity to assist Cox with replacing the stolen medals and decorations, and called it one of the more pleasurable duties of his office. 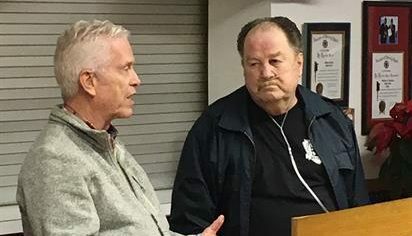 Johnson and Cox shared a private conversation at the Gallipolis VFW Post #4464, after which the medals were presented to the Vietnam veteran in the presence of his family.